1. Soak dried Black fungi ahead of time, thoroughly rinse to get rid of the impurities and set aside. 2. Peel the Raphanus sativus and then dice up. 3. 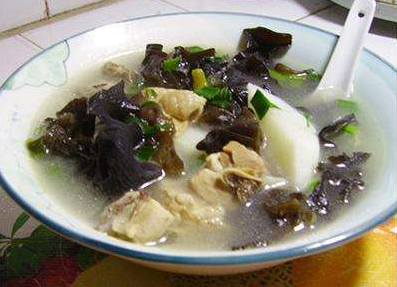 In a stockpot, fill in bowls of chicken soup, combine with 1-2 bowls of water, diced Raphanus sativus, Black fungi and bring into a boil, then simmer till all ingredients are soft and tasty. 4. Sprinkle with a pinch of salt to season. Serve.